Our company Disruptive Innovations together with friend Innovimax will release in a near future a new native EPUB wysiwyg editor on the market, BlueGriffon EPUB Edition. It will be commercial, standalone (ie not a webapp), based on the open-source BlueGriffon. Unlike most existing solutions on the market, it will not rely on a private pivot format. 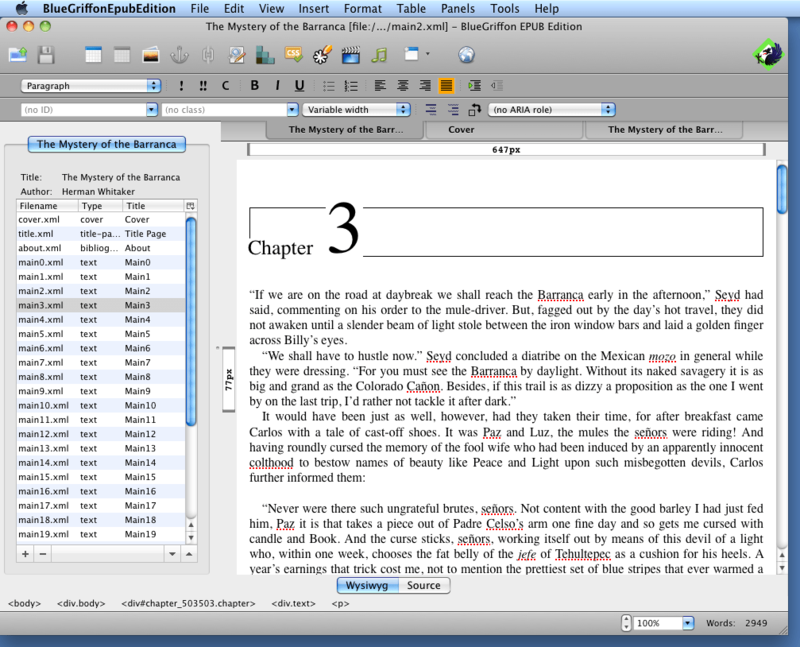 While most other tools can only do “Export to EPUB“, BlueGriffon EPUB Edition will open EPUBs, create EPUBs, save EPUBs. Do whatever you want with the metadata or the contents. Add, modify or remove documents, images, stylesheets, media files, fonts, everything. It will be simple, powerful, and strictly conformant to W3C and IDPF standards. As you can judge from the screenshot below, we’re moving fast… Stay tuned! Можно будет сравнить с бесплатным (хоть и сыроватым) Sigil.